Home » Asesoramiento estudiantil » Get Social, join the WCE Social Room! Get Social, join the WCE Social Room! The doors of our Social Room were opened at the beginning of August! We are really excited about this project, as we once were students living abroad as you may be now. We know that sometimes it is difficult to find a place to stay, as if you were at home. That’s the purpose of our Social Room, we want you to feel free to come to our office to read a book, search on the internet, practice your speaking, meet new people and make the most of your experience in Bournemouth. But what exactly is our social room and what can you expect from it? Our Social Room opens its doors from 9 am to 7pm Monday to Friday (sometimes can be scheduled out of this timetable). We want you to feel free to come along and join all the activities that we have prepared for you! Most of the groups and events are totally free. You can practice your speaking while meeting new people, improve your writing, in our reading and writing group, have a relaxing cup of tea in our ‘This is England Session’ and many more! When there isn’t any group being held in the room, you can use it as your own space, read a book (we will have a little library for you), use our free Wifi or other facilities such as our printer, kitchen, etc. Also if you became one of our WCE premium members, you can get amazing discounts in all our courses, yellow buses cards, transfers, organised trips, and many more! How can I be updated about what is going on in WCE Social Room? Keeping informed about all the events and activities that we are organising in our Room is really easy! You can join our WCE Social Room group in Facebook or visit our website. Also if you want to receive our monthly newsletter, we will send you the list of activities for this month. Welcome to Bournemouth! – this is a group where a British lady will answer these questions that everybody has when arriving to a new city (Bournemouth), such us how can I work in the UK, how can I go to the doctor, what activities can I do in my free time, how can I open a bank account, etc. Speaking and pronunciation group – Our activity leader Filipa Barreto will help you with your pronunciation and you will have very interesting conversations with international students, each day a different topic! Also she can talk many languages so she can understand what are the weaknesses and pronunciation mistakes that some nationalities can make. Also she has a wide knowledge about the learning of a language process so she can give you valuable tips to improve your level of English faster albeit accurately. Writing and reading group – These sessions will be focused each day in a different type of writing, for example: How to write an email, connections, arguments, engagement writing, etc. ‘This is England’ – this session will be focused on the British culture, getting to know their habits and it will help you for a better understanding of their behaviour and traditions. FREE Employment Workshop – Once a month we organise a Free Employment Workshop where we will help you to be ready to start job seeking!. During this session we will review: CV Building and Interview tips! If you wish to join the August Workshop please join the event!. 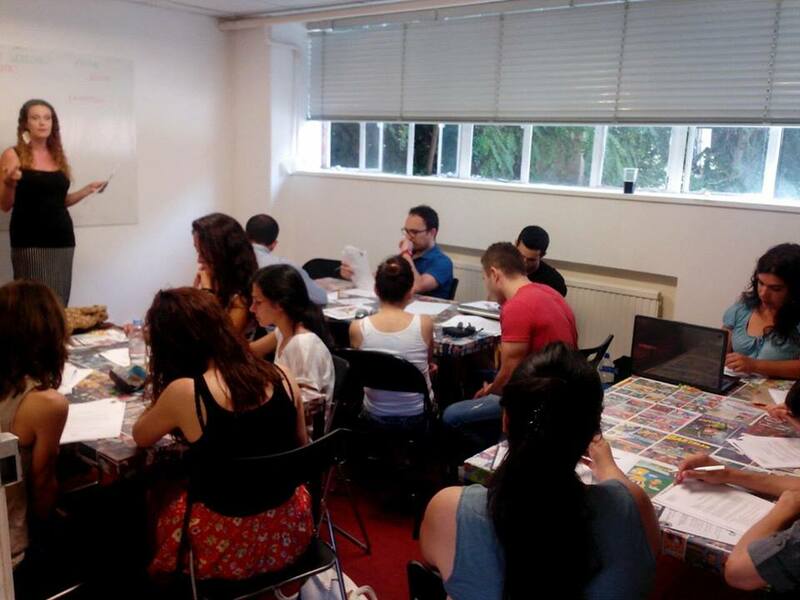 By worldchoiceeducation in Asesoramiento estudiantil, How we help you, Student Advice, World Choice Education on August 7, 2014 .